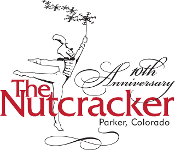 Veria Video In Association With The Colorado School of Dance in Parker, CO presents the 10th Annual Edition of the Nutcracker of Parker for 2013. All orders will be delivered to The Colorado School of Dance studios for pickup inside the Encore store at the studio unless you select the "Mail it to me!" shipping option ($5) during checkout, upon which we will ship your order to your specified shipping address. Videos will be ready in about 6 weeks. NOTE: A Blu-ray Disc player & accompanying HDTV or computer is required to view the Blu-ray Disc product. Also includes the Standard Definition DVD for viewing on older equipment (DVD Player / SD TV).